Need a quick treat for a Halloween party, or just a fun afterschool snack? These Super Easy Halloween Pretzel Bites take just minutes to make! One of my favorite combos is salty and sweet, so once the winter holidays roll around, we always make those pretzels + Hershey Kiss + M&Ms candy bites. We just love them, and they’re easy to wrap up in cellophane for a quick and pretty gift for someone. 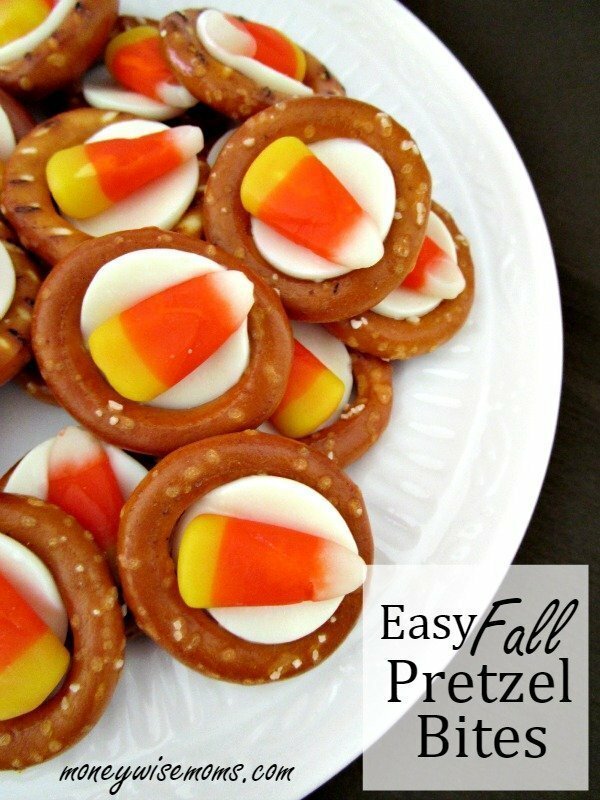 These Easy Pretzel Bites are my take on a Fall or Halloween version, and they take less than 10 minutes to make! They’re perfect for a Halloween party, enjoying game day on Sunday, or any fall gathering with family and friends. This post contains affiliate links. Thanks for supporting MoneywiseMoms at no additional cost to you! While you’re gathering your ingredients, preheat the oven to 200 degrees. I like to use parchment paper on my cookie sheets when I’m doing something melty like this. That way, you can slide the parchment onto the counter for cooling, and there’s no cleanup. Anything that makes it easier, right? Line up your pretzels on the parchment paper. Cover each with a disc of white chocolate. Put in the oven for just 4-5 minutes (told you it doesn’t take long!). 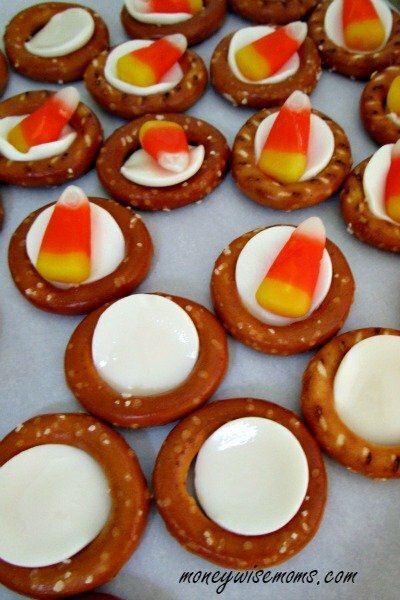 Remove from the oven, and press one candy corn into each. Let cool, and that’s it! These can be stored at room temperature (for as long as they last at your house), or you can make a batch ahead of party time and freeze them. Let them defrost at room temperature ahead of serving. Preheat oven to 200 degrees, and prepare cookie sheets with parchment paper. 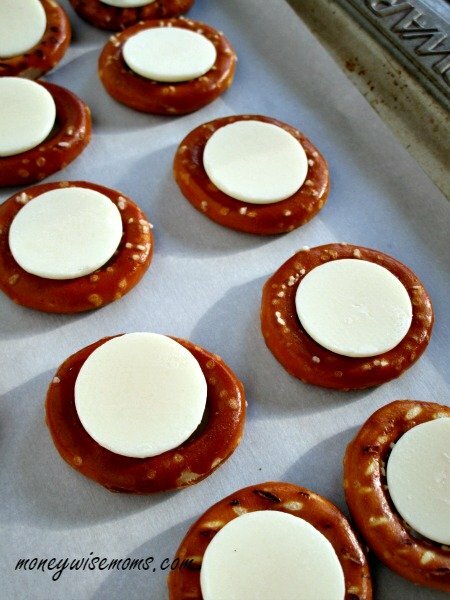 Lay pretzels on parchment paper, and top each with one chocolate disc. Bake for 4-5 minutes or until chocolate is shiny and slightly melted. 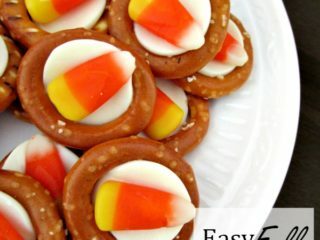 Top each with one candy corn, and let cool. Linked up to Pin Junkie Pin Party at Pin Junkie, Kitchen Fun & Crafty Link Party at Kitchen Fun, Handmade Hangout Party at A Glimpse Inside, Tasty Tuesday at CreativeKKids, Too Cute Tuesday at Funky Polka Dot Giraffe, Family Fun Ideas Linky Party at Seasonal Family Fun, Tickle My Tastebuds at Lori’s Culinary Creations and Tuesday Talk at GrammieTime. I found you via #TastyTuesdays. Pinning this now, its way cute! These look like the perfect fall treat. 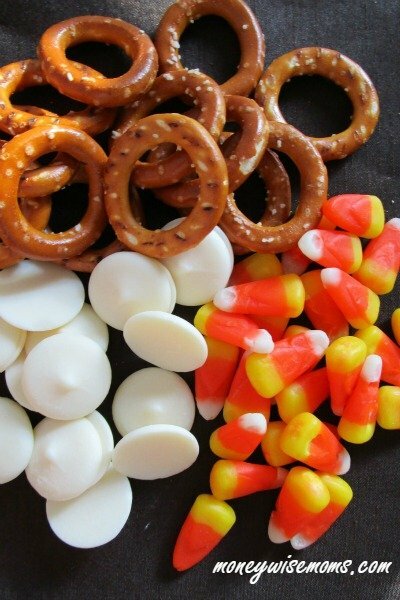 I love salt and sweet together too, and usually like to eat a mix of candy corn and peanuts, but these look good too! That sounds good, but we can’t have peanuts in our house (allergies). Enjoy! I love easy sweet treats! I’d probably eat too many and have to work out longer and it would be worth it! So glad you joined us for Tuesday Talk! I’m Elizabeth – one of the Tuesday Talk co-hosts: “All Kinds of Things” (allkindsofthingsblog.com)! I’m excited to pin this idea and share it with the followers in my new blogging space at thislittlehomeofmine.com! So glad we’ve connected – Let’s stay in touch!